It takes courage to be a good goalkeeper. Keepers must throw their bodies into the fray of players in order to block or catch a ball to help their teams. A goalkeeper facing an opponent about to shoot must get as close to the forward as possible, giving him as little space as possible in which to score. This should be done in the most efficient way with the least amount of injury risk. To begin with, the keeper should be properly clothed. Repeatedly diving down on firm ground can cause certain grass burns or grazes. A good suit with padded hips will help to prevent chafing from the ground. Also, beginning goalkeeper training should be on soft ground. If you have a team of pee wee players or those that are under-10, it will take time before they “harden” themselves to play on any surface. Most goalkeeping soccer drills are aggressive in nature. Work in twos and have a teammate dribble slowly towards the keeper from thirty yards. The keeper should advance to meet the ball in a crouched position to cut down his teammate’s angle. When about fifteen yards from the ball, the keeper should prepare to go down by keeping his body as low as possible so that he doesn’t have to swoop on the ball and so that his head can be kept steady. He should then throw his legs sideways and his body towards the ball so that the side of his calf, thigh and hip come in contact with the ground early enough not to allow the ball to slide under his body. As he hits the ground the momentum of his body will still be moving forward (this is when keepers get those pesky burns) and the ball is gathered with his lower arms. His knees will now come up quickly and his head will be slightly forward so that he completely smothers the ball. The best place to gather the ball is into the lower chest. If the forward attempts to take the ball around him, his hands will help one way while his feet can be used if he goes the other way. By going down in this manner the injury risk is minimized. To go down head first is not only dangerous and also his body covers only a fraction of what can be covered going down sideways. Once your keeper has gained confidence at going down, practice getting the teammate to dribble the ball towards him and to lose control slightly. The keeper then should advance to meet him in a crouched stance and look for the mistake. When he loses control the keeper can then go down at the ball. Now have the teammate go in towards the keeper with speed and try to score. The keeper then needs to look for a slight error such as when the teammate has played the ball too far in front of himself. It’s often said that in all sports a tentative player who’s too “careful” and plays to avoid injuries ends up being the first one injured. A goalkeeper must be courageous especially in these dangerous situations. If he is afraid of diving at the feet of an advancing forward, or goes in tentatively, then he’s risking injury to himself and harming his team. 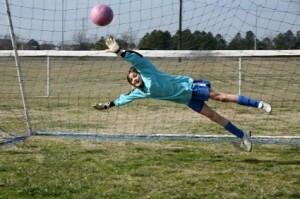 At training sessions, make sure that you prac­tice with your keeper skills to get this confidence. With two or three team-mates, practice the keeper as often as you can. This will instill the confidence in him to be competent and courageous. It’s likely you’ll find that special player on your team who fits the keeper mold. It’s more of a mindset than anything else. Consider yourself lucky if you have such a player. i have an 8yr old son playing in an under 9s comp.Its his first year at being graded. He’s in the B grade but has’nt the skills of the rest of the team. his previous team and coach was all about having fun. The coach was a dad who’d never played soccer. This coach after one trial game want’s to put my son in goalie for the whole season. I’m not impressed with this becouse he hasnt yet been given the oppotunity to learn the basic skills, not to mention he wouldnt even get a good run on the day of the game. At what age are perminant positions usually determined? Great post, will come back to read more. Ihave a very tall goalkeeper of 6ft 3inches he is only 16 and he always find it difficulf to react to any fast shot on goal what type of trianing can i organise for him . as a state coach, i start to maintain the goal keeper pool. because i was face many problem in last years.my three goal keepers was injured the senour leage tournaments. now , my new goal 10 keepers are not interest to hard training. so how to motivate them mental ability to hi practice . My son is a Goalkeeper for a U8 comp team, where his coach is always yelling or raising his voice at my son to come out, where to kick the ball when he makes a save.My son is being trained by a 23 year old college starting goalkeeepr for the last 6 months.The coach told my son not to listen to the goalkeeper coach anymore or me.I hope after my talk with the club founder/ goalkeeper coach this coach is not part of the coaching next year.He assumed just because the rec team he got handed to went 12-1-1 last year, that at the next level it was going to be the same.Im looking forward to a new coach or Im going to another comp team where there is coaches who posses the proper coaching license& knowledge to teach my son the right way.